Lionel Messi and Cristiano Ronaldo are currently peerless in their choice of profession. In the world of football, there is the two of them and then there is a chasing pack of players who just can’t seem to catch up. The two of them have been smashing records for fun and own the last four. Messi recently broke Brazilian football legend Pele’s age old record of most goals scored in a calendar year and Ronaldo can’t seem to stop putting the ball in the net for Real. But this article is about their individual brands and not their on-field expertise. It is well established that both these players are the leading protagonists when their respective teams step out on the pitch and are hence tied down to lucrative long-term deals. As per France football magazine, Messi is currently the highest paid football player in the world with estimated earnings of 33 million Euros in 2012. Ronaldo features at the 3rd position in the same list with reported earnings of 29.2 million Euros. However, according to Forbes if off-the-field income is taken into account, Ronaldo and Messi are 2nd and 3rd respectively. David Beckham continues to rule the roost at the number one position. In terms of Social Media presence, which is a major draw for sponsors as well as fans, Ronaldo leaves his diminutive Argentine rival far behind in his wake. Ronaldo has more than 50 million fans on his official fan page, far more than any other sports team or player. As a matter of fact, Ronaldo’s fan page is the 13th most popular fan page of any kind on Facebook. If tabloid presence is considered as a parameter, then Ronaldo again scores one over Messi. Ronaldo is ubiquitous when it comes to gracing the back pages of his tabloids. Furthermore, Ronaldo has carefully managed his brand image by hiring entertainment company Creative Artist Agency to manage his deals. Ronaldo also has his own fashion logo called “CR 7”. On the other hand, Messi’s father manages and advises his career moves and endorsement deals. There is no shortage of endorsement deals for the both of these players. Ronaldo has sponsorship deals for Nike, Armani, Coca-Cola and Castrol while Messi is the face for Adidas, PepsiCo, Chery and KFC. 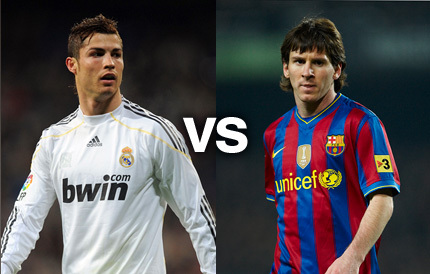 Both these players come from a Latino heritage but Ronaldo’s ability to speak in English is another big advantage. 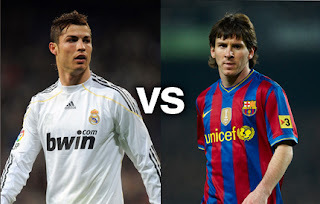 Ronaldo scores high on the Glam Quotient scales and is a true showman whereas Messi is an artist who goes about his job with tremendous humility. Overall though, brand Ronaldo probably edges it when it comes to being the more marketable athlete. Ronaldo is a complete Athlete !!! Messi may be potent on the field. But Ronald sells like hot cakes on media and adverts. He is unbeatable. His association with the EPL and Liga is an asset.